The Dual USB Wall Charger creates a reliable power source for your iPad/iPhone/iPod/Cell Phone and other devices. The USB ports allow you to charge two devices, such as your iPad and iPhone, simultaneously. The charger is equipped with retractable prongs for portability. 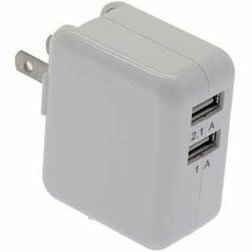 USB/ Mobile Chargers are regularly used by mobile device holders. You can now replace your mobile chargers or get one for your new devices at SF Cable. We have quality USB/Mobile Chargers and wide range to meet your requirements. Our wide range of products include cigarette lighter Y adapters, Cigarette lighters power inverters, universal travel power adapters, portable USB 5000 mAh external battery charger power banks, universal travel adapters, and many more products to choose from. Our products are manufactured at ISO 9001-2000 registered industries and are environment friendly as well. We source our products directly from the manufacturers hence helping us to offer them at very competitive prices. You can also expect good after sales service from SF Cable along with lifetime technical support.